The Suits for a Cause clothing drive is in its 9th year! This March, Suits for a Cause will unite the legal community to support WHW (formerly Women Helping Women). Law firms and legal businesses will join together to hold simultaneous clothing drives supporting WHW, an Orange County non-profit that provides, at no charge, comprehensive employment support services to empower the unemployed and underemployed in our community to get and keep a good job. This year, Dana Heyde, a partner at Cottle Keen Lopiccolo & Heyde, LLP, is co-chairing the event with Orange County Women Lawyers’ Association. The Suits for a Cause breakfast is sponsored by Aptus Court Reporting. All Southern California law firms and legal businesses (from solo practitioners to international firms) are invited to participate in Suits for a Cause 2019. 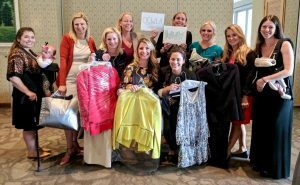 To participate, firms simply need to organize a clothing drive (even one donation counts!) by emailing a flyer to their firm about Suits for a Cause 2019. WHW will provide flyers and donation receipts to all participating firms. All participants along with the sponsors will be listed on WHW’s website, and are invited to a breakfast on Wednesday, March 26th, at WHW. This year, there will be two Suits for a Cause drop-off events. The first is at OCWLA’s monthly meeting on March 8th, 2019 at Andrei’s: Register here. The second is the Suits for a Cause breakfast at WHW on March 26th. Participants can also drop off their items at WHW’s location in Irvine anytime during March. If you would like to participate in Suits for a Cause 2019 by holding a clothing drive or donating clothing anytime during the month of March, please contact WHW’s Suits for a Cause chair and OCWLA board member, Dana Heyde, at dana@cklhlaw.com. To view the list of current sponsors and participants, please visit the Suits for a Cause website and see the flyer here: Suits for a Cause Flyer – 2019. Montage Legal Group is again honored to serve as a sponsor of Suits for a Cause, along with the other sponsors listed below. Please help spread the word by using the hashtag #WHWSFAC2019 in your social media posts!